Pío is an arachnologist with experience in taxonomy and ecology. 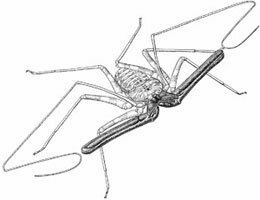 His main research interests are the taxonomy, systematics, ecology, conservation and biogeography of Opiliones. In addition to working with Opiliones, he also has experience in the taxonomy of other arachnid orders, such as Amblypygi, Schizomida, Solifugae, and spiders of the family Pholcidae. Pío joined the AMNH staff in 2016 and is currently in charge of the Arachnid (non-Araneae) and Myriapod Collections. Pío began his studies at the University of Zulia (LUZ) in Maracaibo, Venezuela, where he received his undergraduate degree in biology in 2008. During his time as a student, he worked in the Museum of Biology at La Universidad del Zulia (MBLUZ). Upon graduating, he started working as a research assistant of the Biodiversity Unit at the Instituto Venezolano de Investigaciones Científicas (IVIC) in Caracas, Venezuela. In 2009 he studied at the National Museum of Natural History of the Smithsonian Institution in Washington, DC, where he received training in curatorial techniques and management of various natural history collections. In 2015, he defended his doctoral thesis on Amazonian Harvestmen communities at the Instituto Nacional de Pesquisas da Amazônia (INPA) in Manaus, Brazil. 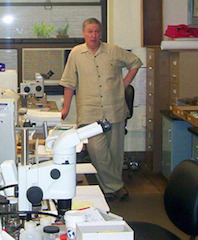 Lou began his career in arachnid studies during his graduate work at the University of Connecticut where he researched arthropod parasites of spiders. In 1978, Lou began work on spiders and other arachnids under Dr. Norman Platnick, in what was then the Department of Entomology at the AMNH. Over the years he has sorted through many spider collections and labeled thousands of vials and has worked with many arachnologists, some visiting and examining the museum's collection and sometimes at other institutions during his visits or on excursions from arachnology meetings. He fields many public inquiries regarding insects and other arthropods. He has interests in entomophagy and forensic entomology (the latter includes stored products, urban, and medico-legal studies). Some of the cases and investigations have been aired online, on television and radio and in the print media. At present, some of his studies include investigations of the common bed bug, Cimex lectularius (Hemiptera: Cimicidae) due to the relatively recent increase in infestations of many homes, business, hotels, by this insect and for which he receives inquiries on their natural history and biology and management. He keeps a few bed bug colonies for study and for educational purposes. While completing his BS in Horticulture at the University of Connecticut (1977), Steve was trained by M.J. Brush in the Biological Illustration studio and began working as a scientific illustrator, drawing bugs for Dr. James A. Slater. He later received his MFA in New Genres/Video at The San Francisco Art Institute and has worked variously as a carpenter, video maker, artist and illustrator. 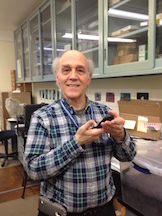 He began full time employment at the AMNH in 1999 as a Scientific Assistant, providing illustration, photo and graphic support to the Division of Invertebrate Zoology. 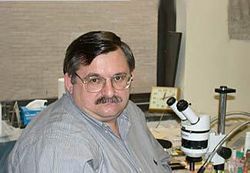 Vladimir is a research associate in the Division of Invertebrate Zoology at the American Museum of Natural History (AMNH), and Curator of the Arachnological Collections at the Zoological Institute of the Russian Academy of Sciences. Dr. Ovtsharenko's research is on spider taxonomy: the science of identifying and classifying species according to their evolutionary relationships. Since the AMNH houses the largest spider collection in the world, with over a million spider specimens, and the arachnological research carried out there is among the best in the world, it is an ideal place for Vlad to work. Boris has a wide range of research experiences and interests, primary within the fields of Invertebrate Zoology, Biogeography, Evolution and System Theory approach in Biology. His Master's project in Arachnology (1979) was performed at Far East State University at city Vladivostok (Russia) and dedicated to orb-weaving spiders Family Araneidae of South East Russia. In 1989, he earned his Ph.D. in Entomology from Novosibirsk Biological Institute and it was dedicated to horse flies and deer-flies (Insecta, Diptera, Tabanidae) of South-East Transbaikalia. Currently, Boris am working in collaboration with Vladimir Ovtcharenko on the study of the ground spiders of Australia and New Zealand and the study of invertebrate dynamics in the Black Rock Forest.